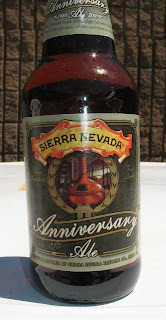 by Stone, Sierra Nevada has released their 2008 Anniversary beer. I believe this is the 28th Anniversary, though I don't think they have released a beer every year to commemorate the event. This year's release, like last year's, is an IPA. Like last year, this is 5.9%. The label looks the same too. In fact, when I saw it on the shelves at Trader Joe's, I thought the distributor was trying to dump some old stock. Looking closer, I saw the label on the neck said 2008. I didn't buy any, though. Everything about the beer said to me, "Hey, why spend the $7.49? I'm the exact same beer you had last year! Go home and try something new!" Then I got scared 'cause the beer was talking to me and I ran out of the store. This I loved and I hope you get some soon and put the talking beer behind you to do so. Enjoy.